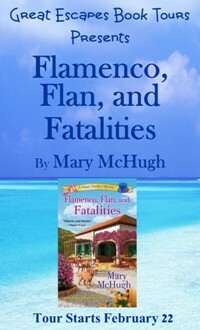 Flamenco, Flan and Fatalities serves up just what it says: good entertainment, good food and good mystery! I am looking forward to reading other books in this series. Talk about transporting the reader – I felt as if I were in Spain for the last few days. I enjoyed this book a little better than I did the first Happy Hoofer mystery. There were a lot of twists and turns in this book that kept me guessing. The characters have depth with unique characteristics and conflicts. I think I’ve fallen in love with this series! No joke, how can you not love a cozy series with a group of dancers called the Happy Hoofers? Its impossible, I tell you. It is a delightful trip with these ladies covering dancing, information about Spain, photography tips, a little romance and drama, and some great food and recipes. I especially liked the descriptions of the scenery and the places they visited, including the restaurants, and that there were recipes for some of the things that they tried along the way. It was fun to see how all the characters interacted and how their thought processes worked. You will laugh your way through this fantastic read. The characters are hilarious and the story line will keep you moving through the pages until the end. I loved this book and reading about the great recipes included in the story. This book was full of adventure and mystery and had pulled me in and wouldn’t let go! I liked reading about the camaraderie of the five friends, and their sightseeing in Spain, just as much as trying to figure out whodunit. 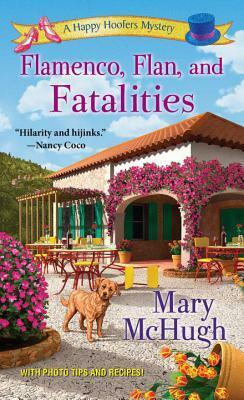 Mary McHugh has penned a very humorous mystery with a key emphasis on friendship. …more fun with dancing, more murder, great sights on a train ride in Green Spain, more romance ..